static const std::string POLICY_NAME = "lru"
The least recently used entries get removed first. Everytime when any entry is used or refreshed, Policy should witness the usage of it. Definition at line 64 of file cs-policy-lru.hpp. Definition at line 36 of file cs-policy-lru.cpp. 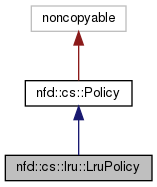 const std::string nfd::cs::lru::LruPolicy::POLICY_NAME = "lru"
Definition at line 70 of file cs-policy-lru.hpp.